Members of the medical community have frequently learned alignment that is based on studies of the general population - these studies show that everyone has turnout, and so it's been accepted as normal and natural. However, mechanically-speaking, our gait and our joints work best if feet are straight. So it seems most likely that cultural influences such as ballet have led to turn-out being so common among North Americans that literally all of us are damaging ourselves by doing this while thinking it's perfectly normal. Crazy. It is pretty amazing how our bodies can heal and reset to a more natural state when it is supported by the right environment. 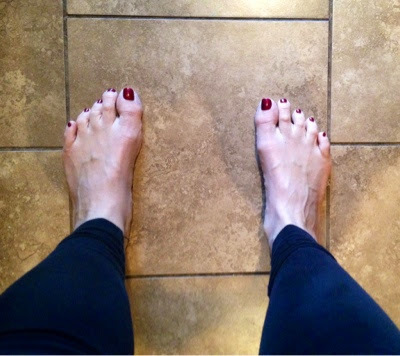 My favorite yoga sequence for my feet is http://www.yogadownload.com/Utilities/GenericProductDisplay/tabid/110/prodid/2875/default.aspx When I am off the mat, I try to constantly strengthen my standing feet with a version of mountain pose. Keeping my feet parallel has helped my alignment the most.